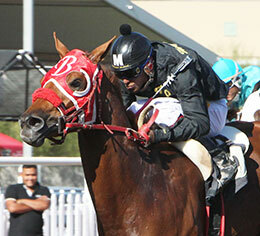 Dominate This qualified for the Grade 3 West Texas Derby at Sunland Park Racetrack & Casino. SUNLAND PARK, NM--MARCH 9, 2018--Dominate This a stakes-placed son of multiple stakes sire DOMINYUN, was a half-length winner in the sixth of seven trials contested on Friday for the Grade 3 $187,916 West Texas Derby at Sunland Park Racetrack & Casino. Ridden by Emillo Tapia, Dominate This completed the 400 yards in :19.474 seconds, a 91 speed index, to get the fifth fastest qualifying time. Trainer JJ. Gonzalez, II saddled last year's AQRA President's Fall Futurity runner-up for owners Angel Hernandez and Jorge Herrera. Bred in Oklahoma from the Valiant Hero mare Valiant Red Vixen, Dominate This has compiled a (8) 4-2-1 record and banked $31,230. The Brenda Reiswig-bred gelding was also fourth in the Arizona QRA Futurity last year. He has won both his starts this year. The 10 fastest qualifiers will return to Sunland Park on Saturday, March 31 to vie for the $88,320 winners' share of the total purse. For a complete list of finalists, times, sires, dams, owners, breeders, trainers and jockeys CLICK HERE.